Ruins of a Biblical city in the community of Psagot. This may have been the site of Joshua's Ai. Joshua 7:2: "And Joshua sent men from Jericho to Ai..."
Home > Sites > Judea> North > Khirbet Nisya, Psagot - Ai? 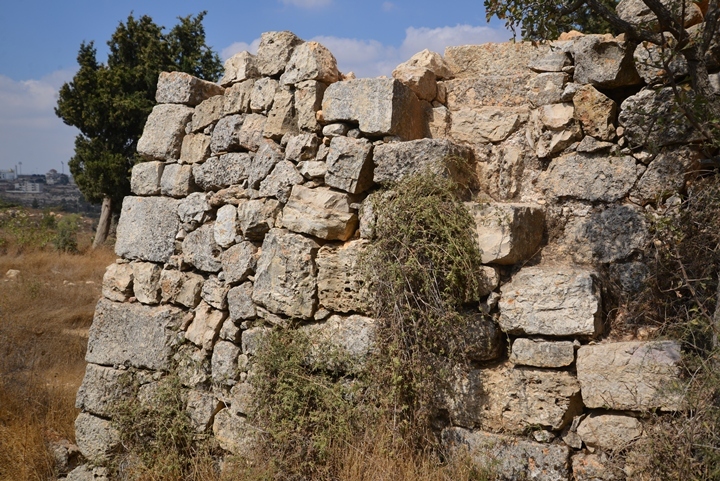 Ruins of a multi period agriculture village, dated from the Middle Bronze II to the Early Roman periods, are located in the community of Psagot. The archaeologist who excavated the ruins proposed that these ruins were the location of the Biblical city of Ai - the second city that Joshua and the Israelites conquered during the conquest of the Land. 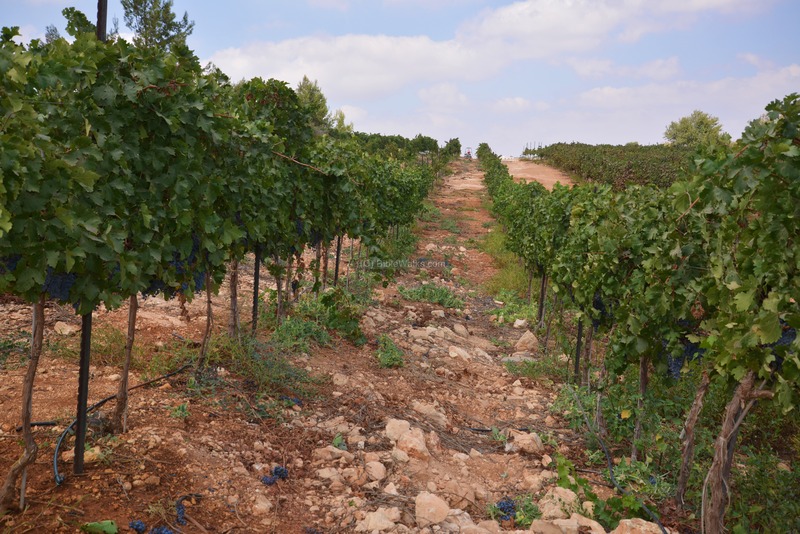 The archaeological and topographic features indeed match the Biblical description, although there are other candidate places that were suggested for the Canaanite city of Ai. 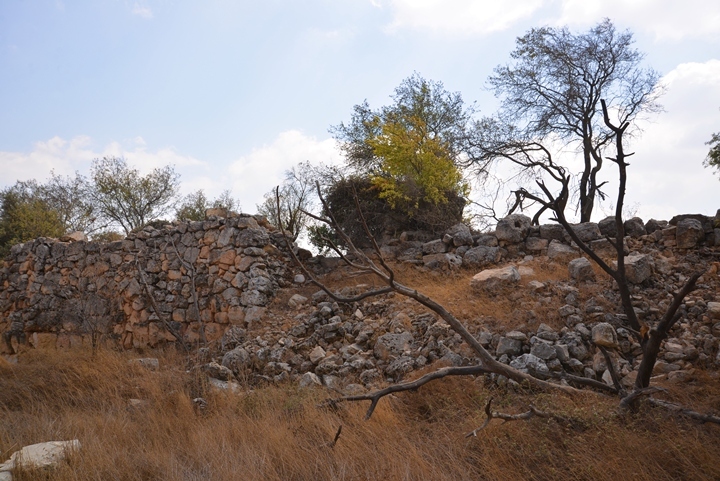 The ruins of khirbet Nisya (Nisieh) are located on a hill, at an altitude of 856m above sea level. Two deep valleys are located on the north east side (200m from the summit) and south west sides (600m away). It sits on the eastern slope of the prominent mountain of Jebel et-Tawil - "the tall hill" (907m above sea level), which is in the center of Psagot. The ancient site is accessed through the Psagot community. After entering into Psagot, drive to its south eastern side, following the signs to the site of "Ai". The Canaanite village was founded in the Middle Bronze period II (2000-1550 BC) and continued to the Late Bronze period I (1550-1300 BC). Remains of this period, found in the archaeological excavations, included a variety of ceramic vessels, an Egyptian scarab and a five-ribbed dagger. No architecture remains, such as walls and a gate, were yet dated to this period. They might have been eroded in time, or demolished by the later settlements on the hill. Based on other sites, the walled village must have been surrounded by a mud brick wall and a gate with a base made of field stones. After the LB I period, the site was abandoned for several hundred years. This pattern fits the case of Canaanite villages that were conquered by the Israelites during the 13th century BC or so. A Biblical map is below, with a red marker indicating the location of the site, is shown here. The map provides some suggestions to the Biblical places, but not all of them are fully identified. For example, the location of Ai has several suggested locations (et-Tell and Kh. Maqatir). According to Dr. Livingston, who excavated the site of Kh. Nisya, this was the place of the city of Ai that Joshua conquered after Jericho. 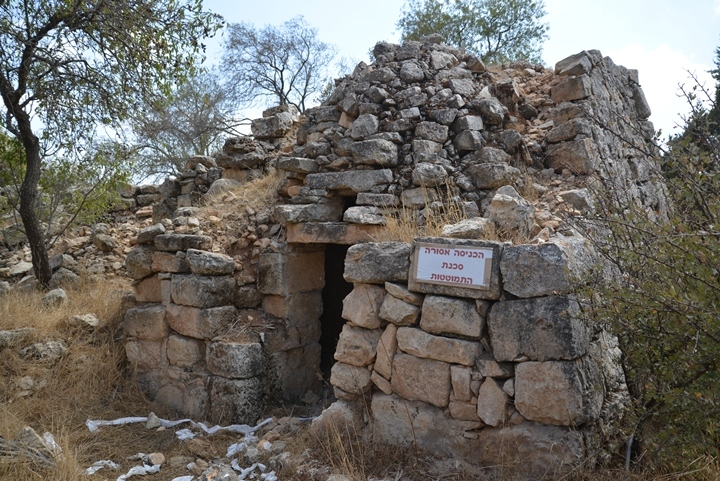 Livingstone based his theory on the excavation findings and the Biblical description. Other identifications for Ai were suggested, such as et-Tell, 2 KM south east of Beit El (by E. Robinson, C. Wilson and W. F. Albright, although it was not supported by archaeological evidence as it lacks the MB level), Kh. Maqatir (1 km west of et-Tell) and Kh. Marjameh (north east of Mt. Baal Hazor). The following verses provide a detailed description of the battle of Ai, including a set of clues where the city was located, which based his theory. "And Joshua sent men from Jericho to Ai, which is beside Bethaven, on the east of Bethel, and spake unto them, saying, Go up and view the country. And the men went up and viewed Ai. And they returned to Joshua, and said unto him, Let not all the people go up; but let about two or three thousand men go up and smite Ai; and make not all the people to labor thither; for they are but few. So there went up thither of the people about three thousand men: and they fled before the men of Ai. And the men of Ai smote of them about thirty and six men: for they chased them from before the gate even unto Shebarim, and smote them in the going down: wherefore the hearts of the people melted, and became as water". "So Joshua arose, and all the people of war, to go up against Ai: and Joshua chose out thirty thousand mighty men of valor, and sent them away by night. And he commanded them, saying, Behold, ye shall lie in wait against the city, even behind the city: go not very far from the city, but be ye all ready: And I, and all the people that are with me, will approach unto the city: and it shall come to pass, when they come out against us, as at the first, that we will flee before them, (For they will come out after us) till we have drawn them from the city; for they will say, They flee before us, as at the first: therefore we will flee before them. Then ye shall rise up from the ambush, and seize upon the city: for the LORD your God will deliver it into your hand. And it shall be, when ye have taken the city, that ye shall set the city on fire: according to the commandment of the LORD shall ye do. See, I have commanded you". "Joshua therefore sent them forth: and they went to lie in ambush, and abode between Bethel and Ai, on the west side of Ai: but Joshua lodged that night among the people. And Joshua rose up early in the morning, and numbered the people, and went up, he and the elders of Israel, before the people to Ai. And all the people, even the people of war that were with him, went up, and drew nigh, and came before the city, and pitched on the north side of Ai: now there was a valley between them and Ai. And he took about five thousand men, and set them to lie in ambush between Bethel and Ai, on the west side of the city. And when they had set the people, even all the host that was on the north of the city, and their liers in wait on the west of the city, Joshua went that night into the midst of the valley. And it came to pass, when the king of Ai saw it, that they hasted and rose up early, and the men of the city went out against Israel to battle, he and all his people, at a time appointed, before the plain; but he wist not that there were liers in ambush against him behind the city. And Joshua and all Israel made as if they were beaten before them, and fled by the way of the wilderness. And all the people that were in Ai were called together to pursue after them: and they pursued after Joshua, and were drawn away from the city. And there was not a man left in Ai or Bethel, that went not out after Israel: and they left the city open, and pursued after Israel.
" And the LORD said unto Joshua, Stretch out the spear that is in thy hand toward Ai; for I will give it into thine hand. And Joshua stretched out the spear that he had in his hand toward the city. And the ambush arose quickly out of their place, and they ran as soon as he had stretched out his hand: and they entered into the city, and took it, and hasted and set the city on fire. And when the men of Ai looked behind them, they saw, and, behold, the smoke of the city ascended up to heaven, and they had no power to flee this way or that way: and the people that fled to the wilderness turned back upon the pursuers. And when Joshua and all Israel saw that the ambush had taken the city, and that the smoke of the city ascended, then they turned again, and slew the men of Ai. And the other issued out of the city against them; so they were in the midst of Israel, some on this side, and some on that side: and they smote them, so that they let none of them remain or escape. And the king of Ai they took alive, and brought him to Joshua. And it came to pass, when Israel had made an end of slaying all the inhabitants of Ai in the field, in the wilderness wherein they chased them, and when they were all fallen on the edge of the sword, until they were consumed, that all the Israelites returned unto Ai, and smote it with the edge of the sword. And so it was, that all that fell that day, both of men and women, were twelve thousand, even all the men of Ai. For Joshua drew not his hand back, wherewith he stretched out the spear, until he had utterly destroyed all the inhabitants of Ai. Only the cattle and the spoil of that city Israel took for a prey unto themselves, according unto the word of the LORD which he commanded Joshua. And Joshua burnt Ai, and made it an heap for ever, even a desolation unto this day. And the king of Ai he hanged on a tree until eventide: and as soon as the sun was down, Joshua commanded that they should take his carcass down from the tree, and cast it at the entering of the gate of the city, and raise thereon a great heap of stones, that remaineth unto this day. 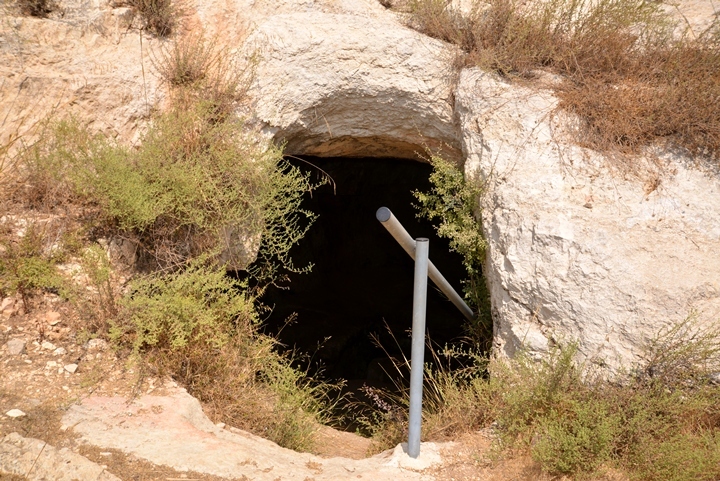 Then Joshua built an altar unto the LORD God of Israel in mount Ebal..."
The Bible refers to Ai as a place near and east of Bethel. It is first mentioned in the travels of Abraham (Genesis 12:8): "And he removed from thence unto a mountain on the east of Bethel, and pitched his tent, having Bethel on the west, and Hai on the east: and there he builded an altar unto the LORD, and called upon the name of the LORD". "on the east of Bethel"
"the men went up and viewed Ai"
"they chased them from before the gate even unto Shebarim"
"abode between Bethel and Ai, on the west side of Ai"
"pitched on the north side of Ai: now there was a valley between them and Ai"
"and fled by the way of the wilderness"
These descriptors, together with the Bronze Age level found in the excavations, match the ruins of Kh. Nisya in Psagot. 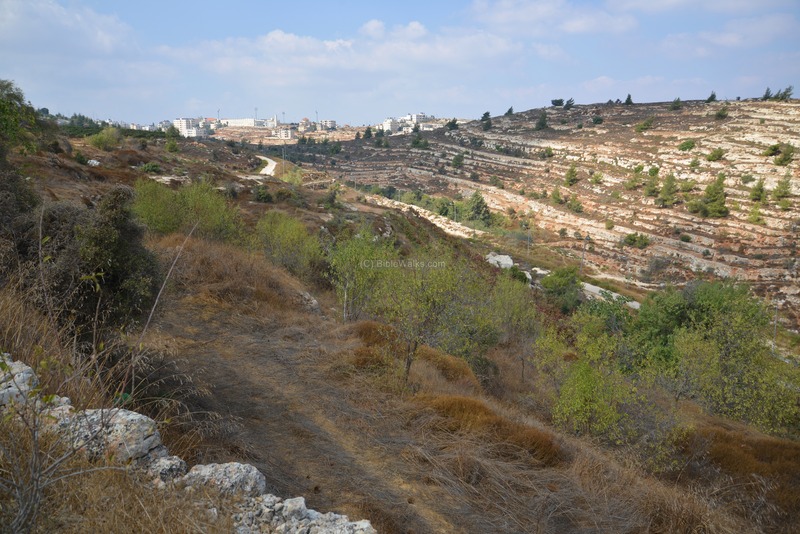 Dr. Livingston matched the features of the site to the above, and also determined that Bethel - the twin city of Ai - was in El-Bireh which is 1.5km to the north west. However, other sites in the vicinity of Bethel could also fit the description, and so the location of Ai is still an open issue. The village was rebuilt in the Iron Age (Israelite period). As part of the Judean Kingdom, it continued during the Iron Age I and II (1200BC-586 BC). 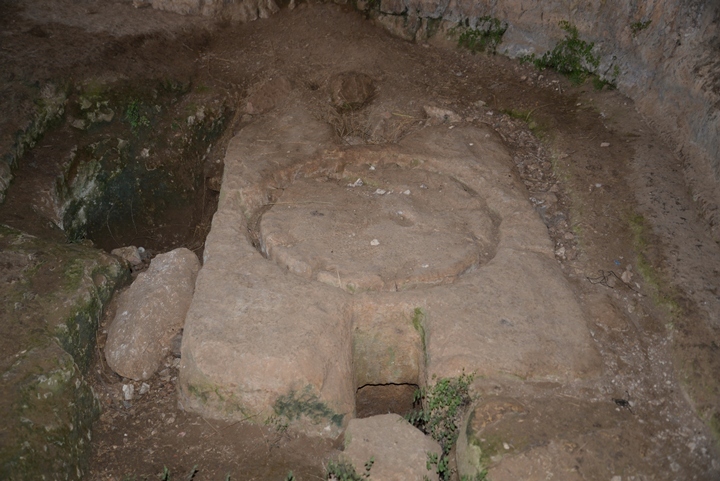 A large and rare rock hewn burial cave dated to the Iron Age I - the period of the Judges - was found on the foothills of the site. Jewelry, ceramic vessels and other artifacts were found in the chambers of the cave. 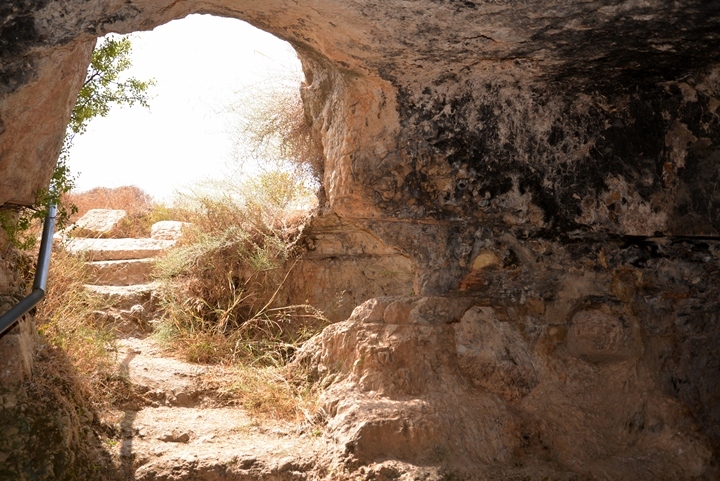 About 50 persons were found buried in the cave, belonging to the same family within the dates of 1200-1050 BC. "He is come to Aiath, he is passed to Migron; at Michmash he hath laid up his carriages". The site was probably destroyed by the Babylonians in 586 BC. Many of the people in the land were exiled to Babylon - thus bringing an end to the Kingdom of Judah. "Now these are the children of the province that went up out of the captivity, of those which had been carried away, whom Nebuchadnezzar the king of Babylon had carried away unto Babylon, and came again unto Jerusalem and Judah, every one unto his city; Which came with Zerubbabel: Jeshua, Nehemiah, Seraiah, Reelaiah, Mordecai, Bilshan, Mizpar, Bigvai, Rehum, Baanah. The number of the men of the people of Israel.... The men of Bethel and Ai, two hundred twenty and three". Khirbet Nisya was a significant Persian period village. Many ceramic vessels of this period were identified in the excavation, proving the accuracy of the Biblical accords. Two elliptical pottery kilns found on site that were dated to the Late Persian and Hellenistic periods. 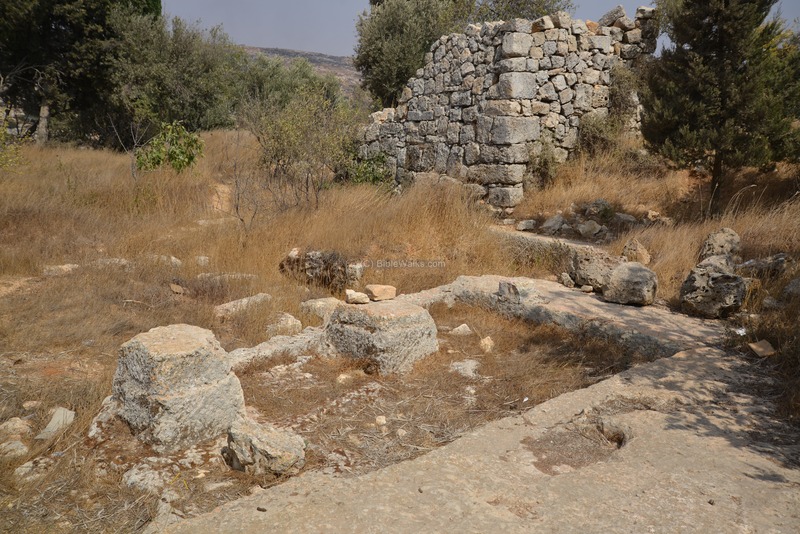 The village continued to be settled during the Hellenistic/Hasmonean and Roman periods. Jewish Mikva'ot (ritual baptismal pools) and Second Temple agriculture installations (oil presses) were found on the north western side (area 88). 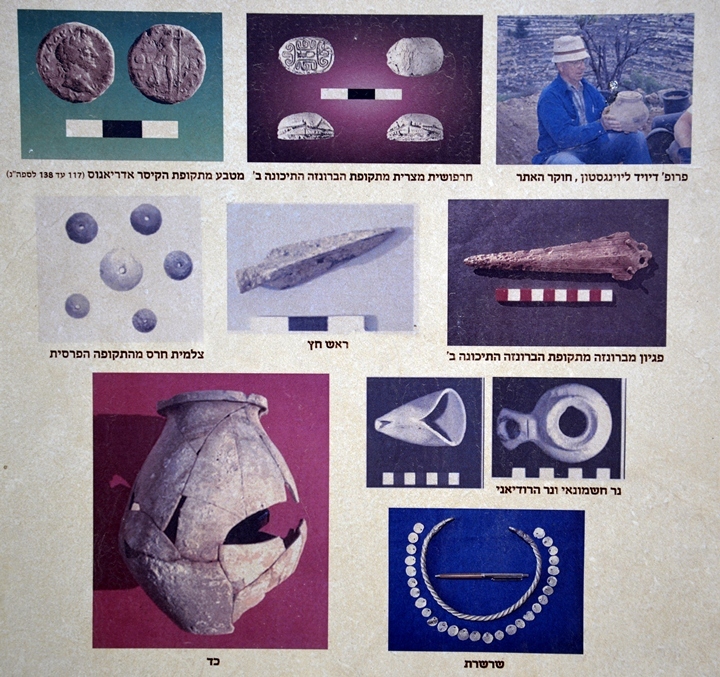 Coins were dated to the Hasmonean and Herodian periods. 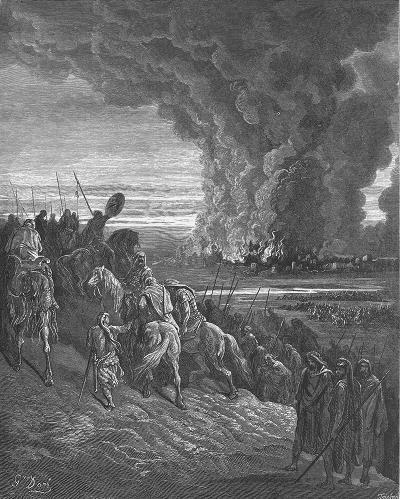 The village was probably destroyed during the Great revolt, as Gallus rampaged through the villages north of Jerusalem. It then was reoccupied, but destroyed for good in the Bar Kokhba revolt (117-138 AD). A hiding complex was found in the oil press cave, which may have been prepared during these revolts. 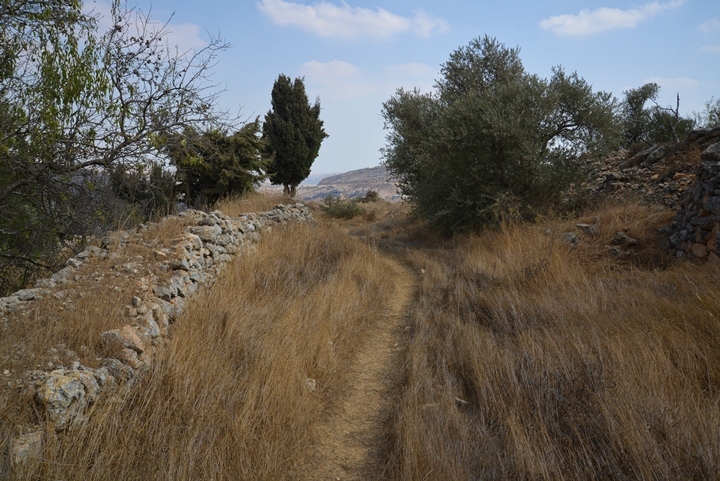 Eusebius Pamphili (better known as Eusebius of Caesarea), a 4th century AD Greek historian of the Church, wrote in his book "Onomasticon": the site of Ai (or: Aggai) is located "To the west of Bethel. They are not far distant from one another". According to this book, the site was in ruins at that time. He also identified Bethel as "Bethel was located at the 12th Roman milestone north of Aelia (Jerusalem) on the road to Neapolis (Shechem)". The site was then unoccupied for more 300 years, from the Bar Kokhba revolt until the Byzantine period. During the Byzantine period a chapel or church was constructed on the site, based on typical fragments were found in the excavations. However, such structure was not found. The area around the site was examined in the Palestine Exploration Foundation (PEF) survey (1866-1877) by Wilson, Conder and Kitchener. They wrote about this site (Volume 3, p. 123) simply as: "Traces of ruins". This implies that at that time the majority of the structures were already robbed and reused in the neighboring villages. A map of the area around Kh. Nisya (Nisieh) is seen here on the right. Notice that the Roman road passed on the west side of El-Bireh. The 12th Roman milestone was located just north of the village, hence the location of Bethel (as per the Onomasticon) could have been in that village, implying that Ai was located nearby. The authors suggested (Vol3 , pp 30-35) several identifications of the Biblical Ai - at et-Tell (near Deir Diwan), Rummon and Kh. Haiy (near Mikhmas). In 1976-2003 excavations on the site were carried out by teams headed by the late Dr. David Palmer Livingston. A total of 16 excavation seasons were conducted on site. They dated findings from the Middle Bronze II ("Canaanite") period through the Early Roman period. 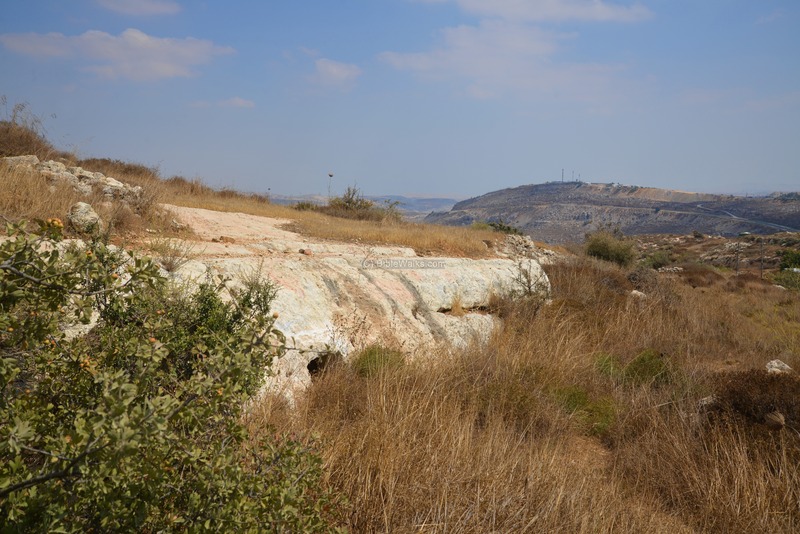 The excavation results, together with the topographic features of the site, closely match the description of the Biblical Ai. 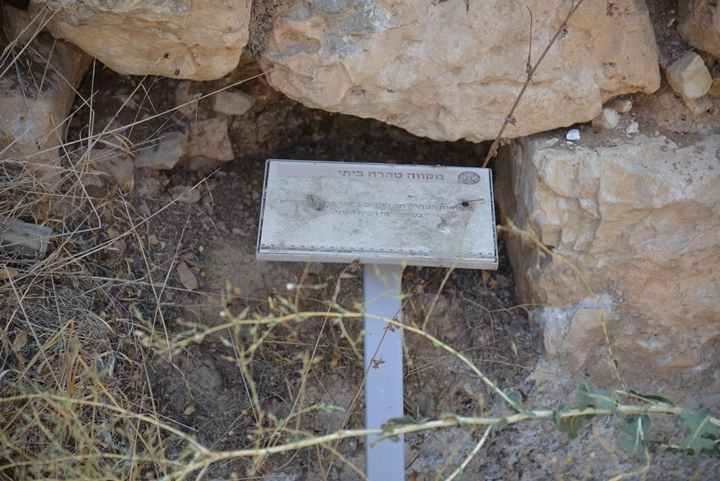 A sample of the findings are displayed in the archaeological park on top of the site. They include (from top to bottom, left to right): A coin dated to Roman emperor Hadrian (117-138 AD), indicating the destruction during the Bar Kochba revolt; A Middle Bronze II Egyptian scarab; Dr. Livingstone; Persian period figurine; an arrow head; a Middle Bronze II dagger; a jar; Herodian and Hasmonean oil lamps; a Mameluke silver torque with 28 silver coins found in the oil press cave. 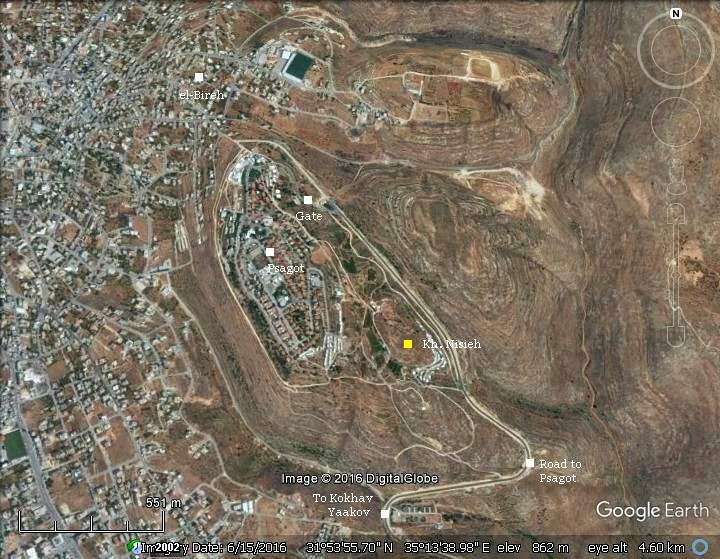 A drone captured this view above the west side of Khirbet Nisya. 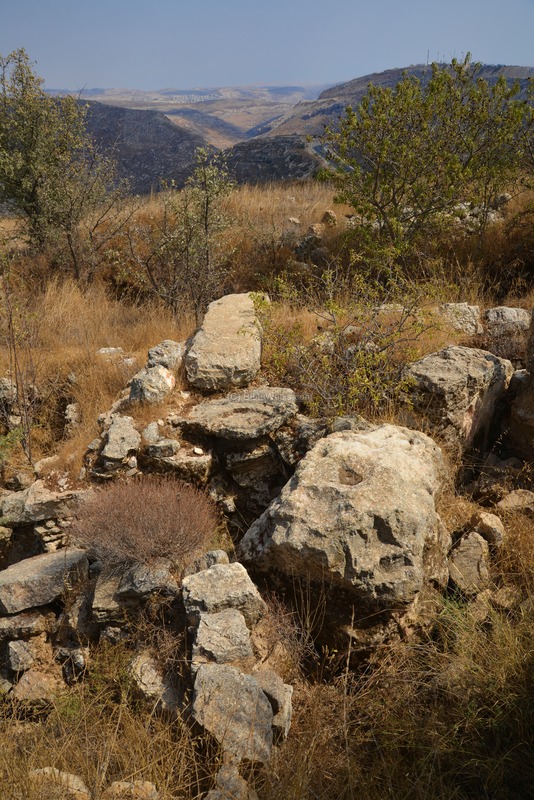 The ruins cover an area of 15 Dunam (4 acres), located on a hill overlooking the valley. Another aerial view is from the north west side. The following YouTube video shows a flight of a drone over the site. 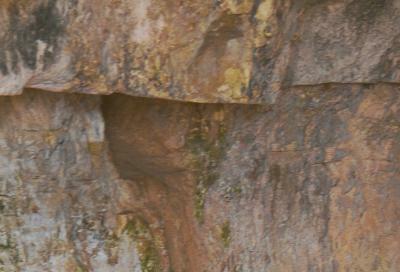 Along the south western foothills are a number of caves and rock hewn installations. The first underground installation is an olive oil press. 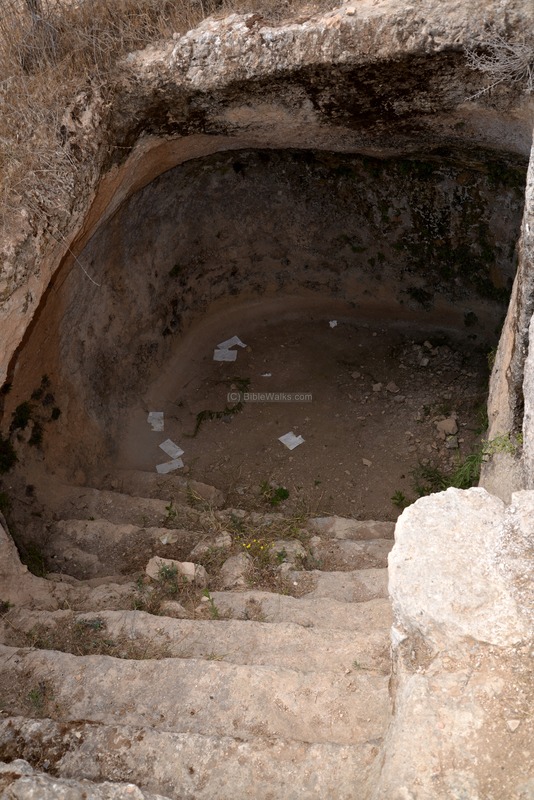 Steps lead down into the hewn cave, where the ruins of an ancient oil press were found. 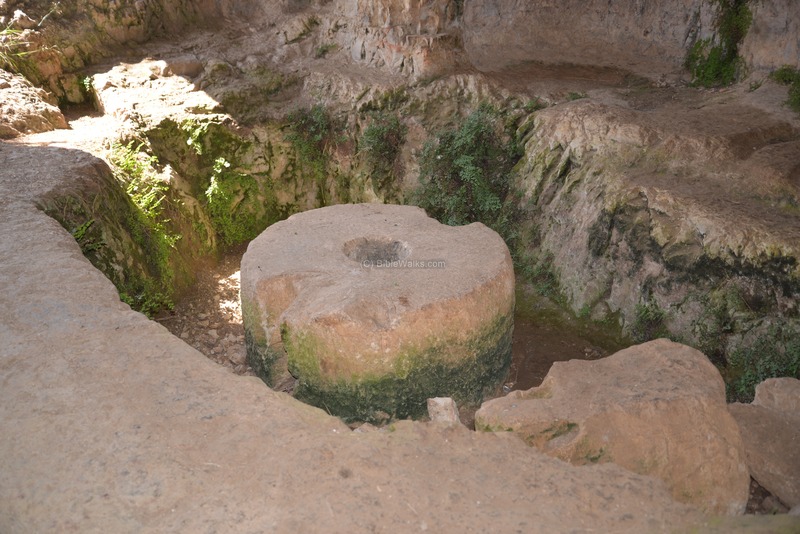 The oil press was in use from the Hellenistic period up to the Early Arab period (7th-10th century AD). 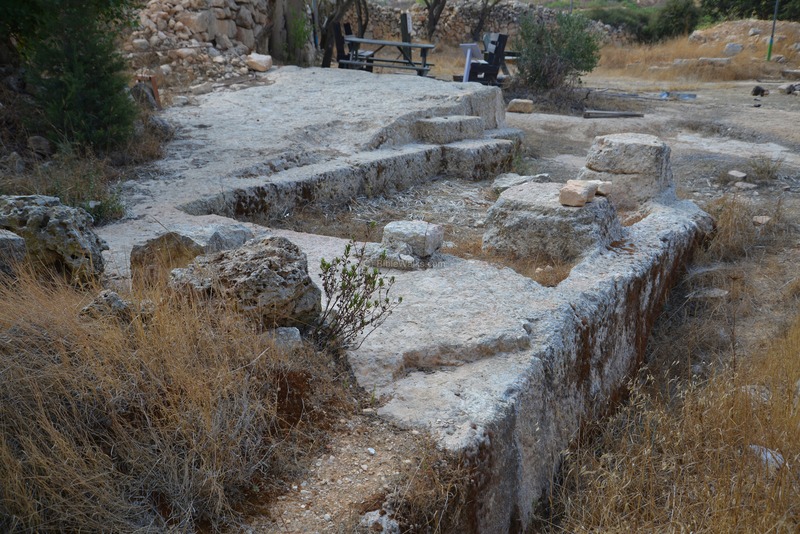 The archaeologist speculates that the olive oil was used in the temple during the second temple period. Its proximity to the large public miqveh (ritual baptismal) may indicate that indeed this oil was used for religious purposes . The underground oil press includes an oil press installation (seen below in the center), an olive crusher (on the right side), and other niches which served the oil production installation. The olive oil production included three steps: (a) crushing the olives, then (b) pressing on them to squeeze out the juice, and finally (c) storing the juice in jars. Step a: Crushing: The oil press used a large rolling stone to crush the olives. 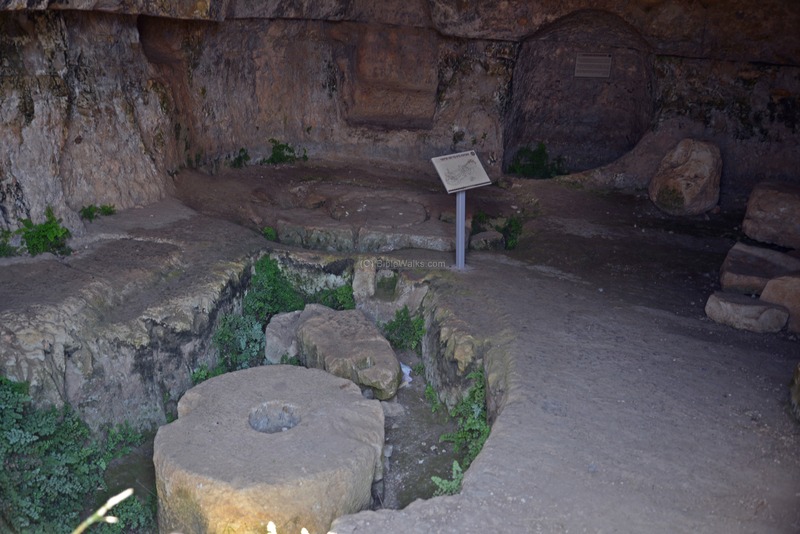 On the side of the cave are fragments of the olive crushing device. The stone was held upright by an axis, which was connected to a long handle. The handle was pushed by humans or animals. The mashing stone rolled along a cavity on the circumference of the base, crushing the olives. The crushed olives would then be collected into a basket and then further processed by the oil press. Step b: Pressing: the second step was to press on the crushed olives in order to squeeze out the juice. They were pressed by an installation known as a "lever-screw-cylindrical weight" press (aka "type 6" press). The illustration explains the elements of the oil press. A wooden lever (not seen in the photo) was held on its two edges by a niche in the wall and a screw installation on its other end above the weight. A wooden installation was connected to the side of the weight, held upright by the twin mortises (cavities) on its side. The cylindrical weight, normally weighing between 1.5 to 4 tons, forced the lever down when the screw was tightened up. The lever pushed down the baskets of olives which were placed on top of the basin. The extracted oil then poured out of the outlet into a collecting vat. 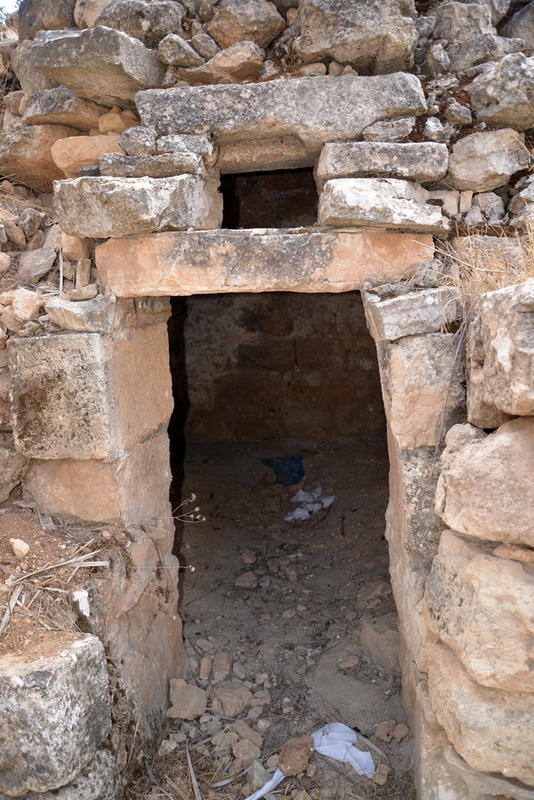 In the back of the wall is the niche that held the edge of the lever (left side) and a chamber to hold the olives before the crushing process (right side). The following photo shows the basin of the olive oil press. The circular groove is a channel that let the juice pour to the side into a collecting vat. The next photo shows the cylindrical weight stone on the edge of the wooden lever. The rounded depression was where the screw moved into when it was turned. On the left side of the cave, which is the north eastern wall, is a narrow hole that leads into a tunnel. This hole is probably a hiding place that was prepared during the Great revolt or the Bar Kokhba revolt. 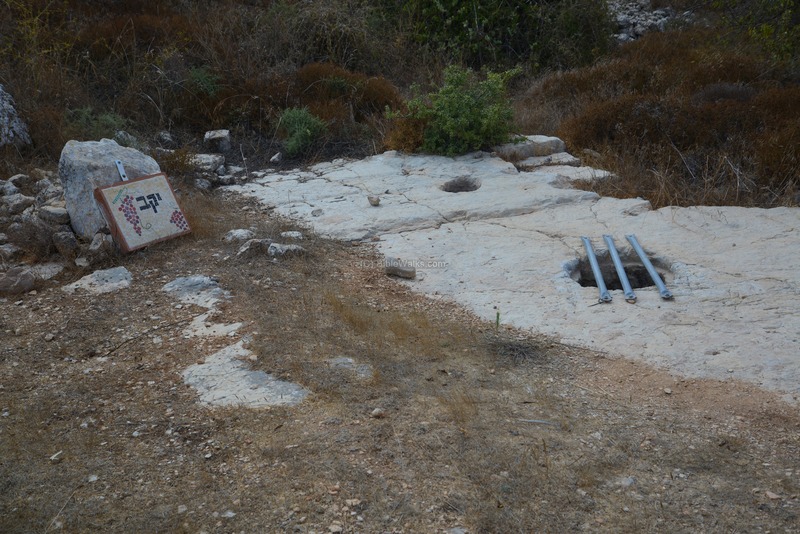 Another rock hewn installation on the south western foothills is a miqveh - a large Jewish baptismal place. This ritual bathing pool is common in Judea, from the Hasmonean period (2nd century BC) up to the Bar Kokhba revolt (2nd century AD). The area on the bottom of the immersion pool, cut into the bedrock, is 2.8m x 3m. A number of steps lead down into the water filled pool, where the person would immerse himself as part of a ritual ceremony. The wide staircase allowed descending and ascending on different sides, so the purified person will not follow the unclean path. A 5.5m x 3.5m cistern was located on its north eastern side, with a door cut through the wall between the cistern and the Miqveh. 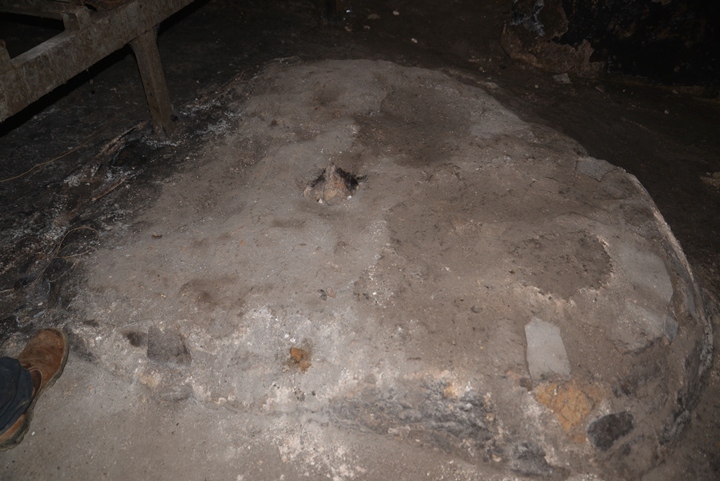 When the archaeologists first inspected this installation, the entrance from the cistern to the miqveh was sealed with plaster and covered by soil. They dated the fill to the Byzantine period, when the site was reoccupied and the new settlers covered it up and sealed the door from the cistern. 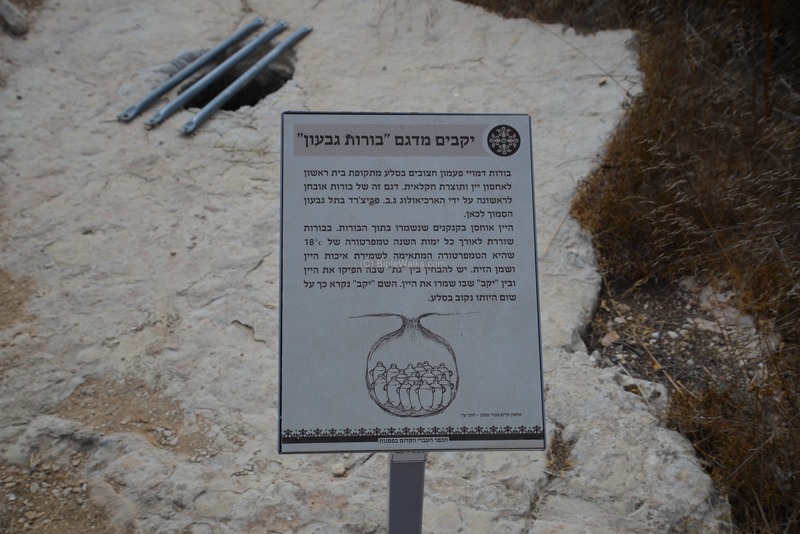 The sign in Hebrew reads: "Miqveh Tehorah" (meaning: reservoir of cleansing). The water inside the Miqveh stored runoff rain water, but during the dry seasons required refills. The hole on the side of the steps was used to pour in buckets of fresh water into the adjacent cistern when the level of the waters dropped inside the bathing pool. Another smaller miqveh (3m by 1.2m) is located on the north east side, on the side of the base of the terrace wall. Four steps lead down into a plastered pool. 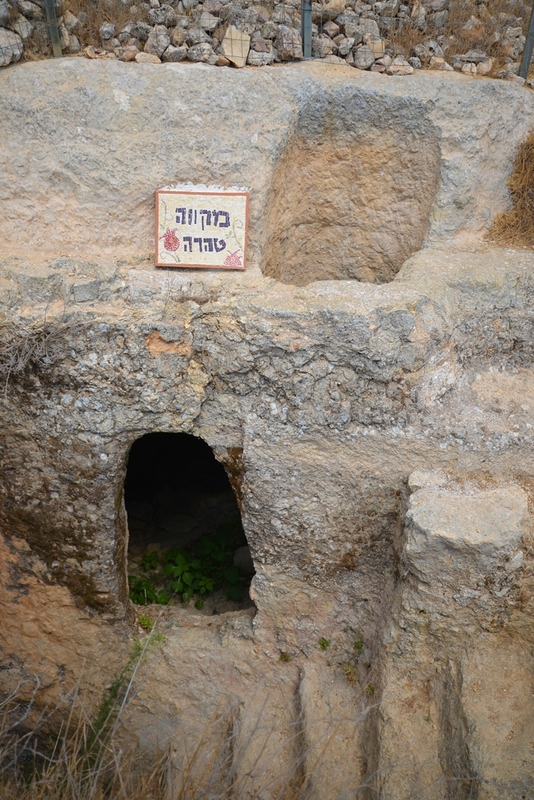 The sign indicates it is a residential miqveh, which was a private installation inside one of the houses. 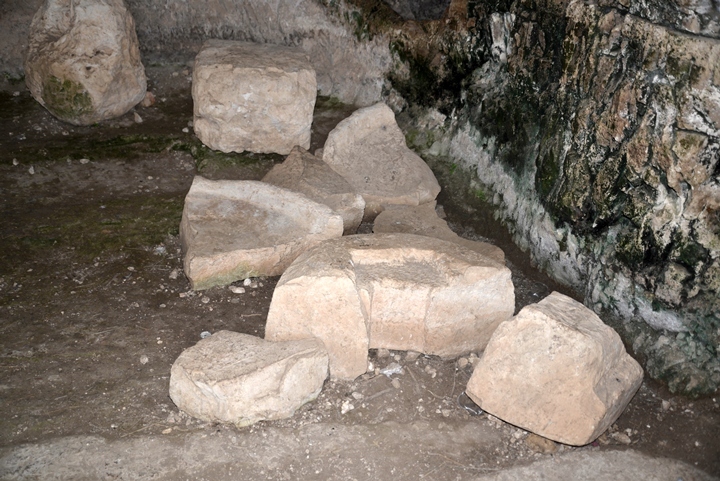 Such private ritual installations were common at the end of the second temple period. On the summit are few structures. Unfortunately, most of the standing structures were dismantled over the years and its hewn stones were reused in the Arab villages around - El Bireh and Ramallah. The left over secrets of the site are mainly buried, but the excavations were limited so far to only several sections. 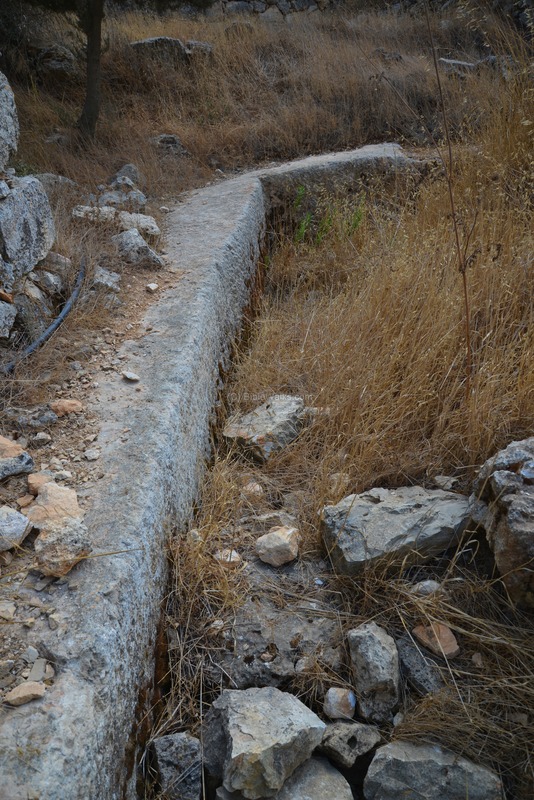 Canaanite cities of the Bronze age were normally protected by high walls, strong gates and glacis slopes. However, evidence of these fortifications were not found, as they were based on mud bricks stones laid over a stone base. 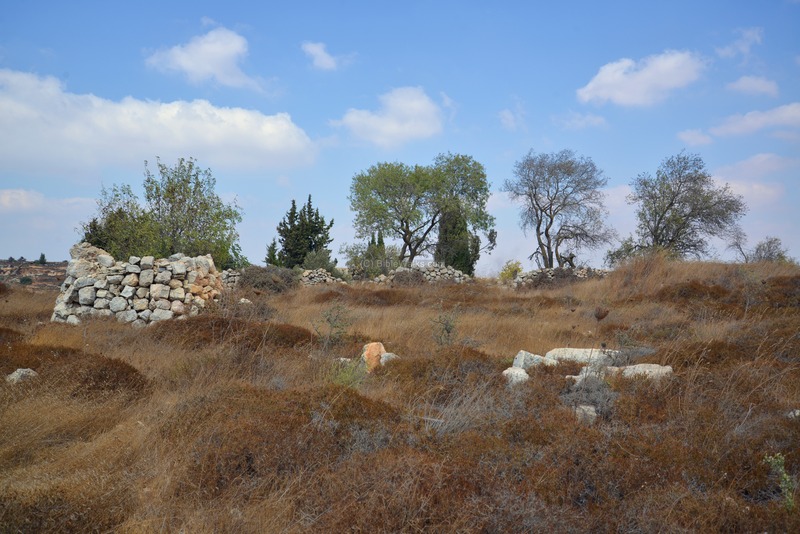 More than 3,000 years have passed since the walled Canaanite city was built, and so the archaeologists did not yet find the traces of these walls which eroded over time. A heap of stones, such as this modern one on the summit of the hill, is mentioned in the aftermath of the battle of Ai as the burial place of the king of Ai (Joshua 8:29): "Joshua commanded that they should take his carcass down from the tree, and cast it at the entering of the gate of the city, and raise thereon a great heap of stones, that remaineth unto this day". An interesting section is located on the northern side of the summit, which is the highest point on the hill. The complex is hewn into the bedrock, which is the reason why it survived. Two unfinished square pillar bases are cut into the bedrock. Two adjoining steps lead up to a platform. This wide bedrock platform is cut away on all sides. The altar must have been located on the rear side of the platform, which is now covered by a modern terrace wall. A drainage ditch, 6-8cm deep, was cut in the bedrock on the western side of the platform. The area was once covered with a white mosaic floor, but now completely gone. Only small chunks of the mosaic floor were found. The pottery found here revealed that the complex was in use during the Byzantine period. However, it may have been reused during that time, and the area may have been an earlier structure, even before the Hellenistic period. Other findings here include deep 70cm cuts into the bedrock (seen below), and a row of nicely cut ashlars in front of the pillar bases, which may have been a collapsed archway. Based on these findings the archaeologists proposed that a monumental building was built above this area. This might have been an Iron age or Canaanite religious sanctuary, such as a Bamah (altar). 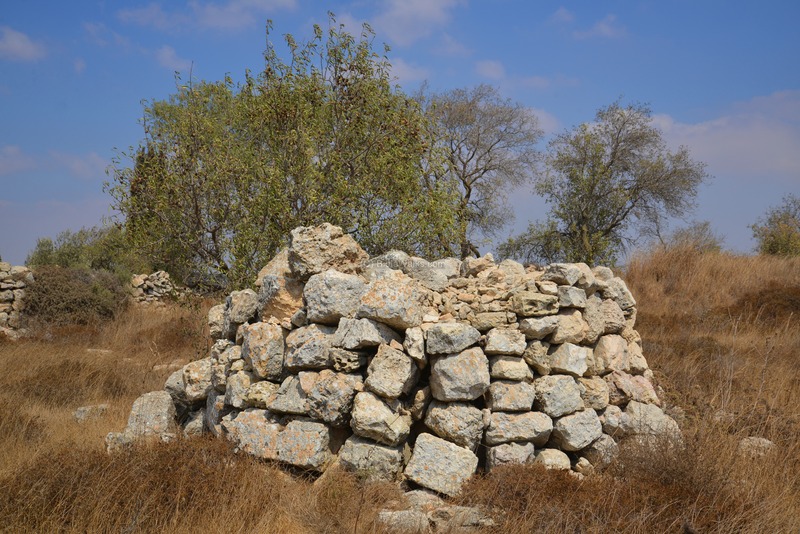 A stone structure is located on the north eastern side, which was a two story agriculture watch tower ("Shomera"). This is probably dated to the Ottoman period. It was built above the soil rather than above the bedrock as the ancient structures. Steps on the south side of the structure lead to the second floor. 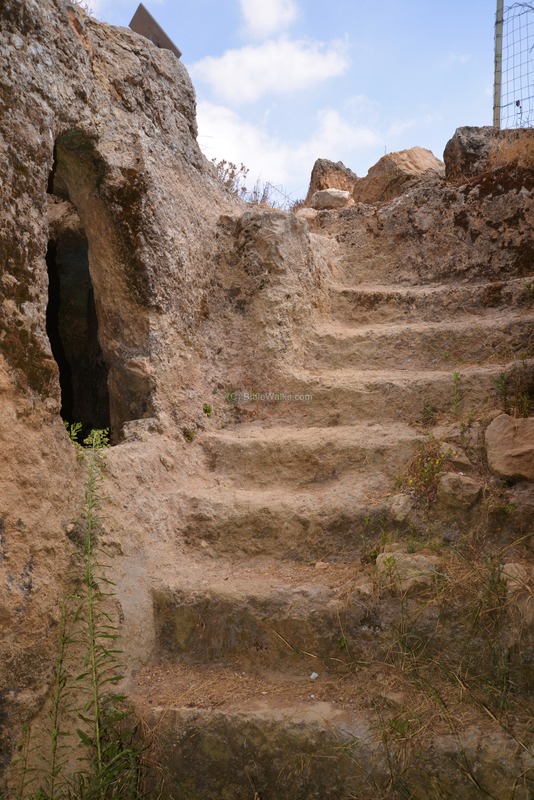 A small chamber is located to the right of the steps. A closer view of the lower side of the tower is in the photo below. The room was probably used by the watch for shelter, while the upper floor gave the watch a higher level to view the fields. Notice that the lintel above the window and the door, as well as other finely cut blocks embedded in the structure, were reused stones belonging to earlier dated structures. Touring around the summit and northern foothills show traces of structures and walls. The ancient site was transformed into a terraced farming area, reusing the ancient stones to build up the walls. Therefore, the Biblical structures were mostly demolished and could not be identified except for isolated places. The summit is now mostly barren, with some trees remaining between the walled terraces. 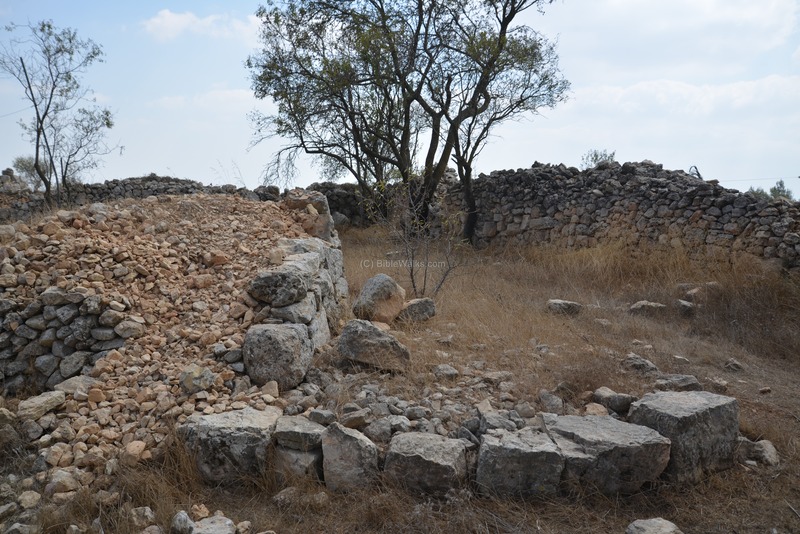 The archaeologists identified, in the earlier section of the structure, an Iron Age tower with gigantic stones probably belonging to a Bronze Age structure. The next photo shows the Northern foothills, with the modern city of el-Bireh in the background. 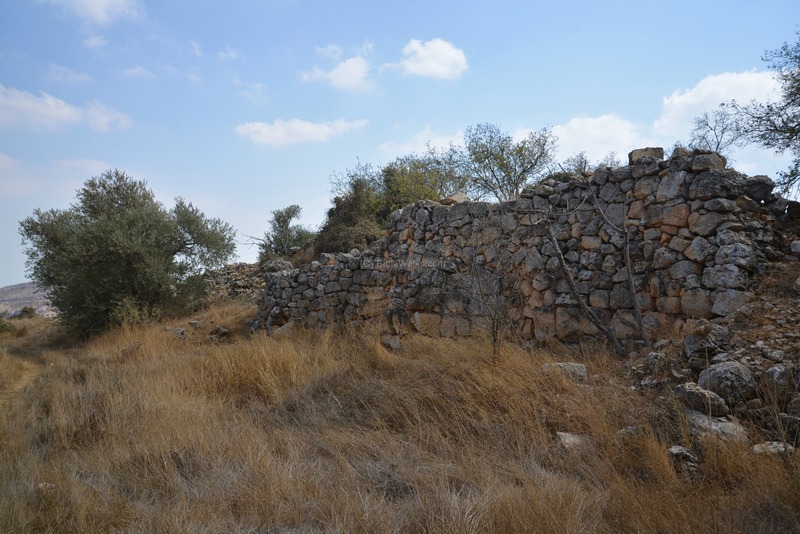 El-Bireh might have been the place of the ancient Bethel, that the Bible identifies as a city close to Ai. A vineyard was planted in 1998 on the west side of the ruins. 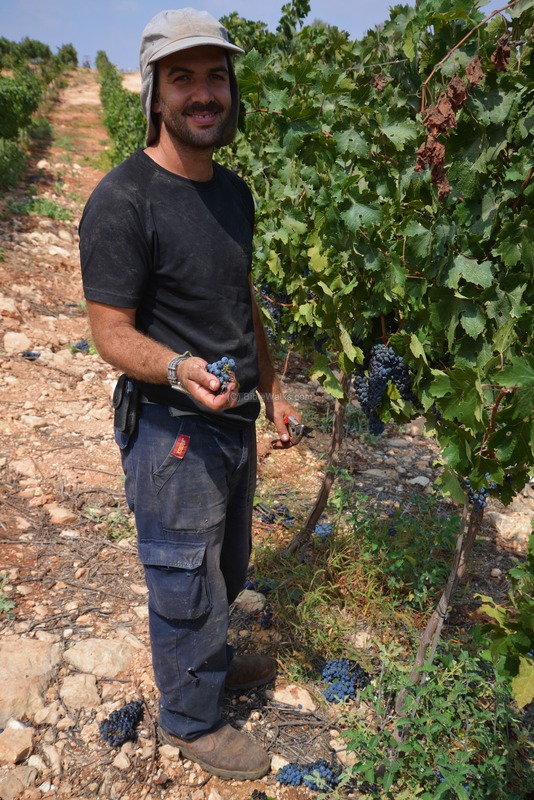 The vineyard was planted and maintained by the Psagot Winery, which was founded in 2003 and produce 8 different types of wine, with 250,000 bottles produced in 2015. The primary wine is a Boudreaux blend named Edom. The prized winery won many awards. 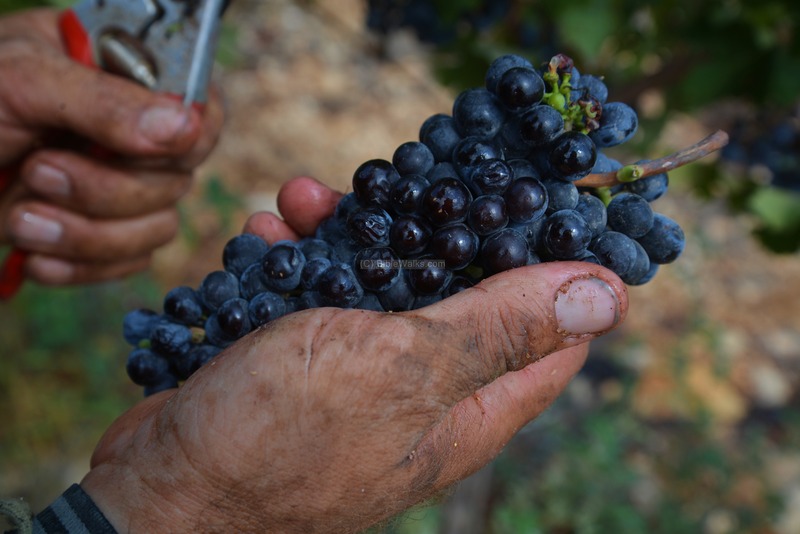 Just look on these amazing grapes and see why... The winery expanded and in 2008 opened a new visitors center in the Psagot Ze'ev community. 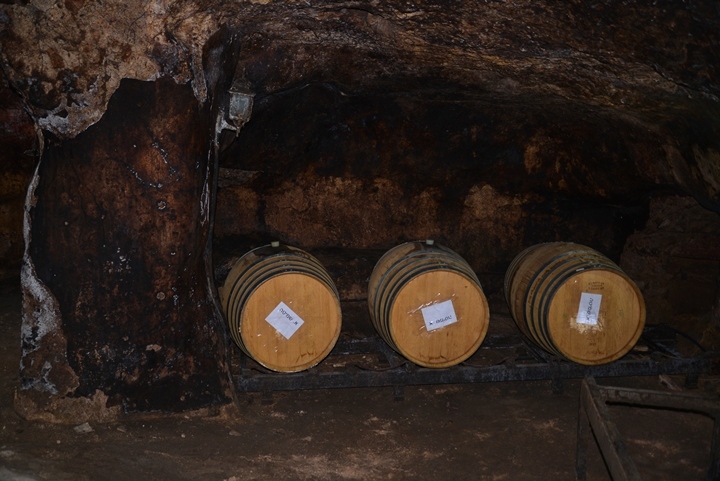 Oak barrels are used to store the grape juice, as part of the aging process. 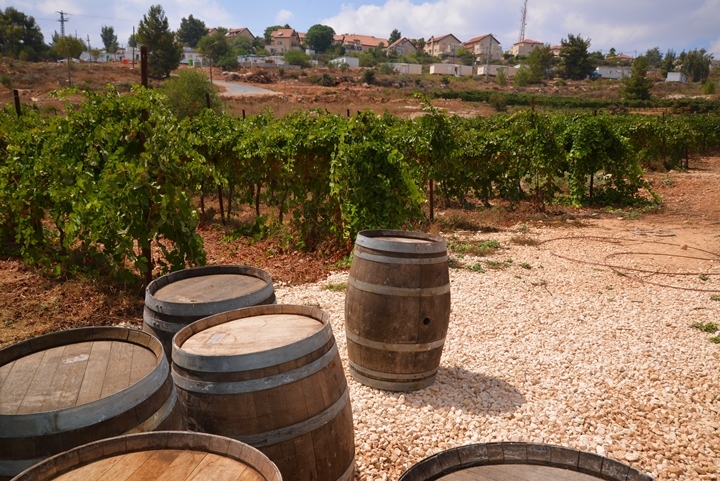 In the following photo are some of the empty barrels, and behind them a section of the vineyard and the neighborhood of Psagot. Inside an ancient cave, dating back to the second temple period, three barrels store a recent stock. The barrels are marked by "Shmita" and date to the year 2015 - the year of the Jewish 7 year cycle which require the farmers to hold back from farming the fields (as per Exodus 23: 10–11). 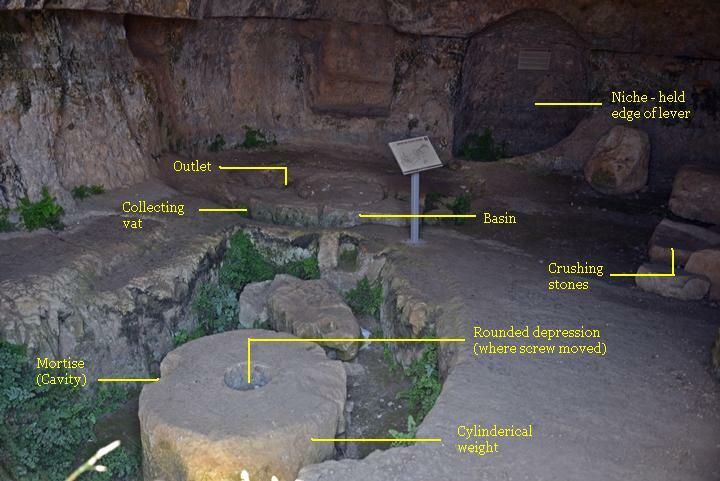 The ancient cave was originally used as an oil press installation. The weigh stone still stands inside the cave. On the north side of the Tel are other rock hewn cisterns, which date to the first temple period. These bell shaped cisterns are of the the "Gibeon" type wine cellars, which are common in Judea and Samaria. 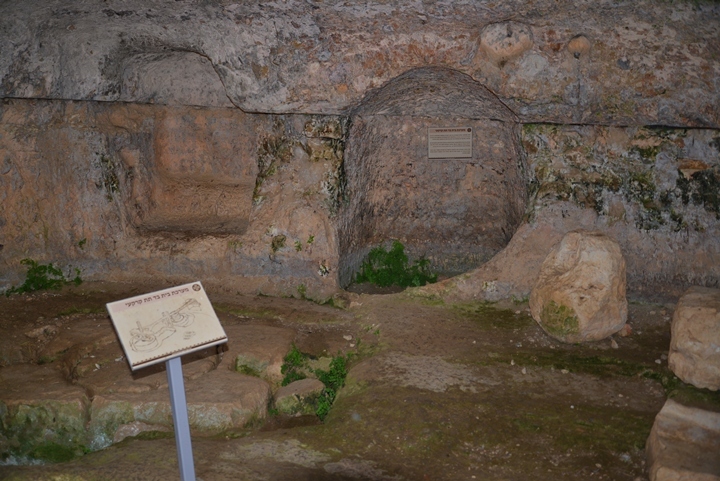 The sign describes and illustrates how the wine jars were kept inside the bell shaped cellars. The underground cellars kept the jars, either wine or olive oil, within a year round constant temperature of 18 degrees Celsius. 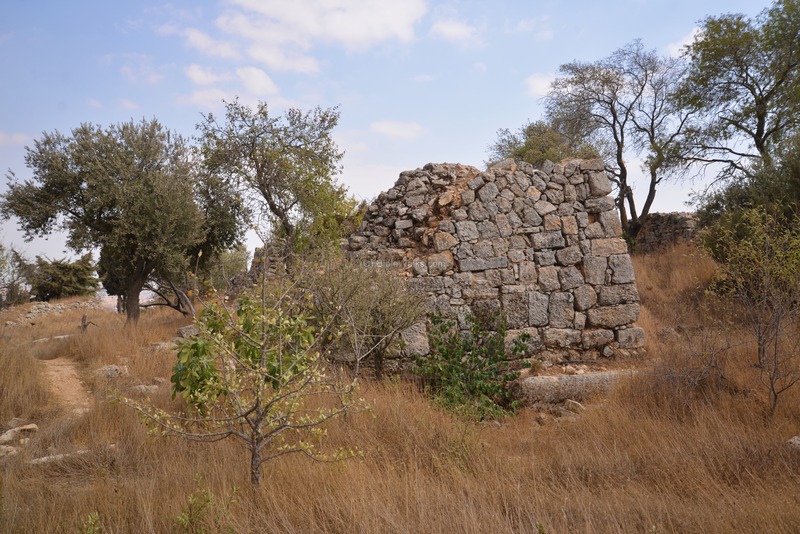 Khirbet Nisieh, Nisya, Nissya - Arabic: "The ruin of forgetfulness, or of credit" (as per PEF). So the name may be freely interpretted as "the forgotten place". Ai - Hebrew: ruin, or heap of stones. Jebel et Tawil - the Arabic name of the hill where Psagot is built, means : "the long hill" or "tall hill". Tell en Nasbeh - Arabic: "the mound of the idol". el Bireh - Arabic: the palace.